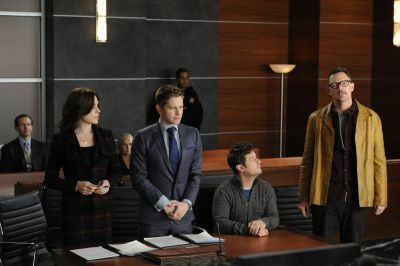 Matthew’s episode of The Good Wife where he guest stars will be airing on Sunday January 5th at 9/10pm CBS. Apologies for incorrect information given out in earlier posts. We did not realise that The Good Wife had a mid season break from the airing schedule, whoops! Matthew’s episode is entitled “David and Goliath” and pleasingly, he appears in three of the episode promotional stills. You can find them below and also in the new album for The Good Wife in our Television gallery. The CBS press report states the episode synopsis below. “Goliath and David” – Alicia represents a band suing a TV show for copyright infringement, but the simple case becomes psychological warfare when Will joins the opposing council and uses his knowledge of Alicia’s strengths and weaknesses against her. Also, Eli hires Kalinda in an attempt to get ahead of a potential scandal, on THE GOOD WIFE, Sunday, Jan 5 (9:00-10:00 PM, ET/PT) on the CBS Television Network. 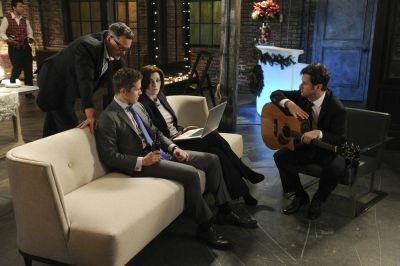 Thanks to TheGoodWifeFan.com for the episode stills and CBS for the episode synopsis! Do you watch the show, are you excited to see Matthew in the midst one of the best television casts on screen? It’s a great way to kick off 2014 for Matthew fans before The Bridge series 2 comes back onscreen in July!